As a judge, author Carla L. Garrett makes decisions based on the rule of law. As a writer, she made one of the best decisions to publish her works, Bouncing Back After Dropping the Ball and A Little Child Shall Lead Them. We’re about to find out more about Ms. Garrett and what the future holds for her. Who is Carla L. Garrett? 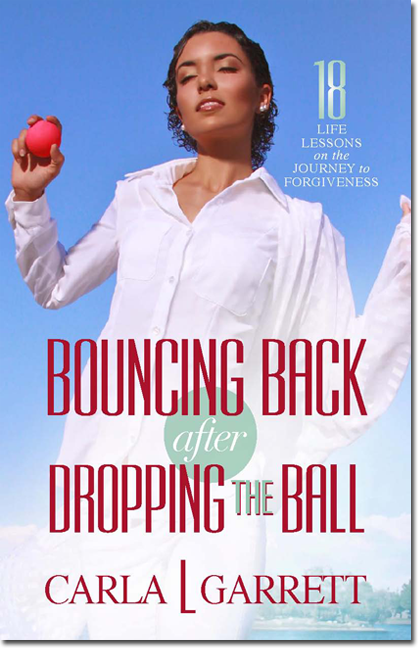 Carla L. Garrett is the author of Bouncing Back After Dropping the Ball—a novel filled with salacious acts of betrayal and a woman’s journey to overcome the resulting heartbreak. Carla is also the author of the critically acclaimed novel A Little Child Shall Lead Them—a contemporary story designed to awaken one’s spiritual giant. In addition to creating novels, Carla serves as an Administrative Law Judge for the State of California, where she presides over a variety of legal matters. Prior, as Deputy Trial Counsel for the State Bar of California, she spent more than a decade prosecuting attorneys for professional misconduct. Carla earned her bachelor’s degree in psychology from UCLA and her juris doctorate from USC School of Law. Carla is the mother of three and lives in the County of Los Angeles. She serves as a speaker at conferences, workshops, and seminars designed to empower and inspire others to achieve their personal goals. In addition, she collaborates with others to empower women, build strong foundations for children, and spread the word about the liberating properties of forgiveness. Writing has always been a creative outlet for me. However, I did not begin writing seriously until my kids were born, more than 20 years ago. When they were babies, I, like any mother, lost the time and freedom to go to the movies on a whim, or do much of anything else for that matter. So during those rare snippets of “down time,” I would sit and write, escaping to wherever my imagination led me. Even though my kids are grown now, writing remains my favorite activity. What inspired you to write Bouncing Back After Dropping the Ball? I had undergone a period in my life when I suffered a horrible betrayal, and struggled to find some heartbreak relief. I was angry, hurt and contemplated various forms of revenge. After some time, I explored the notion of forgiveness, and discovered its wonderful healing properties. This prompted me to write Bouncing Back After Dropping the Ball, which is a scandalous novel that also offers steps on how to forgive someone. In fact, it includes 18 life lessons designed to help those who have been betrayed to overcome the heartbreak without destroying themselves (spiritually, mentally, or emotionally) or others, and to use forgiveness to extinguish the lingering sting of grief in their lives. I wrote A Little Child Shall Lead Them to encourage people who have been touched by the devastation of sickness or disease—either personally or through loved ones—to stand on God’s principles of healing. In reading this book, people will experience more than ever the love He has for them as He rewards them, individually and uniquely, for their faithfulness. Step 1: I made a point of writing something every day, even if it was just a few lines. Eventually, I had enough for a novel. Thereafter, I began the revision process, which included perfecting sentences, moving paragraphs, deleting text, and rewriting portions of the manuscript. Step 2: I had each of my manuscripts edited by a professional. There are many quality editors online, as well as ones that publishers can recommend. I then made the changes suggested by the editors. Step 3: After I finalized my manuscript, I sought a publisher. I self-published my debut novel, but my next book was published by a small publishing company. I found that small publishers respected their authors’ creative process on a greater level than larger publishers. In addition, many large publishers were reluctant to accept manuscripts from individuals who did not have literary agents. I neither had the time nor the patience to procure a literary agent, because many were inaccessible and/or uninterested in taking on new talent. As such, it made more sense to go the small publisher route. What’s your favorite part in Bouncing Back After Dropping the Ball? My favorite part of each of my books is the first chapter. Both of them intrigue the reader immediately, setting the scene for a roller coaster of emotions. What’s the one thing you hope the readers learn from your book? See my response to the question concerning both of my books. Outside of writing this book, I understand you’re involved in other projects. Would you mind sharing what those are with us? Other than serving as an Administrative Law Judge, I participate in a women’s support group that serves to empower women spiritually, emotionally, and financially. In addition, I serve as a speaker at conferences, workshops, and seminars designed to empower and inspire others to achieve their personal goals. Do you plan on attending any events soon? If so, please tell us where you will be? I plan to attend the Dream Girl Luncheon in Burbank on August 30, 2014, and a My Friends Place charity event on September 6, 2014. I also have book signings scheduled for October, November, and December 2014 at various venues. Please check my website, http://www.CarlaLGarrett.com, or Facebook, Twitter, or Google+ for more information about upcoming events. Apply the wise words of Winston Churchill: “Never, never, never give up.” Keep writing, keep creating, and keep testing the limits of your imagination. If you’ve been inspired to write, it is because God has planted something special inside of you that He wishes you to birth. It is part of the purpose and plan He has for your life. Don’t worry about what other people will think about your work. Just write until the project is complete. Trust me, there will be loads of people who will appreciate your work. Be creative. Be determined. Be patient. Be blessed. Posted on August 28, 2014, in Uncategorized. Bookmark the permalink. 3 Comments. I am SO PROUD OF YOU Carla! Carla, You are an inspiration! I’ve just learned of you and this book the other day from Dr. Perri Johnson, and did it strike a cord…actually the entire keyboard!!! I am so looking forward to swimming in this river of forgivenss. It has “been” time, to heal~ Thank you for being witness!